“The abyss doesn’t divide us. We have been the people of the abyss. Our indigenous people have seen the abyss. Our black people have seen the abyss. Our people called white trash have also seen the abyss. All of the poor people of any color and place have seen the abyss. And it is around this abyss that we gather together! around this abyss we feed each other! At the abyss we bring our balms and secrets, potions and sacred sorceries to heal each other. 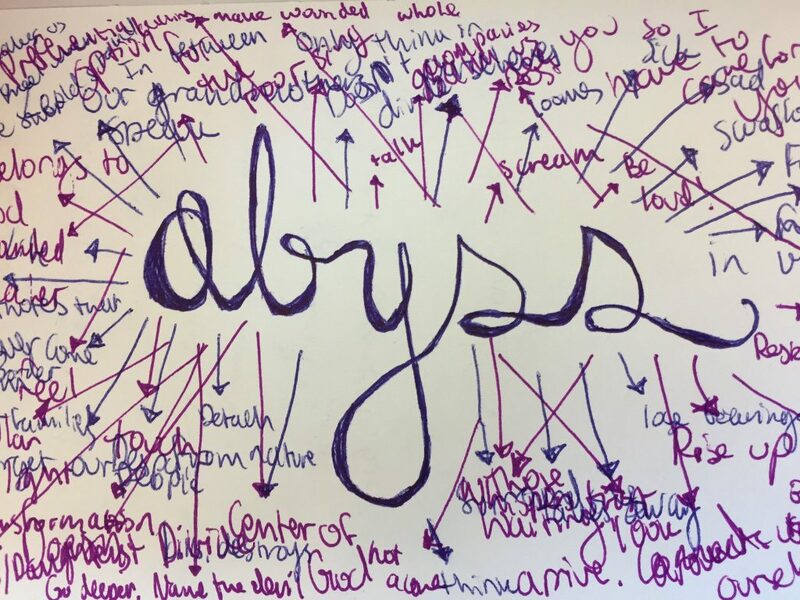 This abyss manifests itself in all of us in many and multiple ways. But we must know that the abyss have both and many sides to it. There is the side of the abyss that is made of colonization and coloniality full force! The abyss of colonization looms large in our lives and in the lives of our familias. This abyss keeps swallowing us and our people time and again! This abyss takes away the chances of a pura vida, pure life as the people of Costa Rica says. This abyss keeps us always in a surviving mode! With no rights, no honor and no ability! This abyss detaches us from nature, from the earth where we truly belong! This abyss makes us forget our own people! We forgot our indigenous people, the undocumented, the black lives killed on the streets everywhere in the American continent! 30 black boys are killed every day in Brazil… every single day! This abyss makes us think only in ourselves because we need to survive! This abyss lives fully in us! And everything that belongs to God! This abyss is both past and future but it is fundamentally our present, right here and right now! This abyss makes me see you as all that I have so I must care for you! This abyss brings restoration to our lives, to our stories, to our families! This abyss reminds us of God’s option for the poor! This abyss brings us back our memory! This abyss gives our voices back! This abyss fills us with courage! This abyss charges us with missions and tasks! This abyss keeps telling you time and again: Yes you can! Yes you can! This abyss brings us to its tipping point and whispers TRUST! For God is with you! This abyss brings healing to each one of us! For there is a balm in Gilead! And God is calling us to be healers of the world, healers of our people! Wounded healers! All of us! Is there no balm in the Latinxs community? So now the health of the daughters and sons of our people start to happen! Are you ready to continue the process of healing? So you are invited to receive healing! Then you turn and heal those who comes after you! We will have 3 people in the front where you will come, receive healing, turn and heal the person after you. But I will be here too and if you do not want to offer healing come to my line, receive the healing and go. A sign of the cross will be placed n your forehead. If you want a circle in your hands, stretch your hands and show that this is your preference.